Steven Pienaar has travelled to Egypt for Sunday's Africa Cup of Nations qualifier despite a knee injury that could rule him out of the Cairo clash. The South Africa captain left with the team on Thursday despite limping out of training in Johannesburg hours earlier. A scan on the knee will determine whether the midfielder, 29, can play in Sunday's crunch Group G fixture. 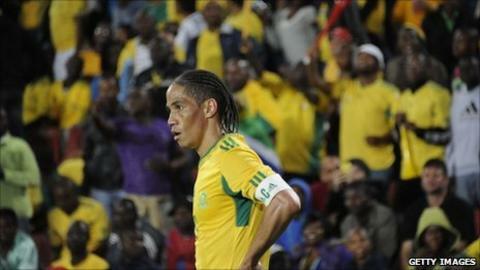 Bafana Bafana coach Pitso Mosimane says he will leave a decision on Pienaar's fitness until as late as possible. "Injured knee this morning...going for scan later today," Pienaar wrote on Twitter on Thursday. The Tottenham Hotspur player had to be helped from the field during the squad's final session before departing for Cairo. Pienaar went down after a challenge by Orlando Pirates defender Happy Jele before receiving treatment on the side of the pitch at the Rand Stadium. He had already been suffering from a groin problem, one which caused him to miss Tottenham's final game of the season on 22 May. "He's struggling," said Mosimane. "You all saw Steven went into a 50/50 with Happy and obviously sustained an injury on the inside of his right knee - the ligament." "We have two days before so let's see. Maybe it will subside, you never know. I must wait and see what the doctor says. "But these things happen - you get injured in training because this is a professional sport." "I will wait until the last moment to take the decision, even if it is on the day of the match. I'm just going to try and not to be emotional about it," he added. Pienaar, who has made 11 appearances for Spurs since signing from Everton in January, has also been struggling with a persistent groin injury. He admitted on Monday he had postponed an operation in order to take the field in Cairo against the Pharaohs, and claimed on social networking website Twitter that a final decision on the surgery would be made next week. With club team-mate Bongani Khumalo already absent with injury, Mosimane now looks like being without one of his most experienced players but he believes the squad can still cope with the challenge. "It wouldn't be nice obviously [if Pienaar is ruled out] but my experience tells me things like this happen sometimes," Mosimane added. "We have 23 players in the squad and if he can't be there then what can you do? We have several players who aren't here already and we have to deal with that." Earlier in the week, Bafana Bafana captain Pienaar said his team must be mentally and physically prepared to face Egypt in a 2012 Africa Cup of Nations qualifier in Cairo. "We're going to have 80,000 people in our face so I think the players need to be physically and mentally prepared for that," Pienaar said. "If we can come away with a point it will be a very good result." Bafana Bafana are top of Group G with seven points from three games. African champions Egypt are bottom of the table with just a single point. Only the group winners are guaranteed a place at the finals in Gabon and Equatorial Guinea.